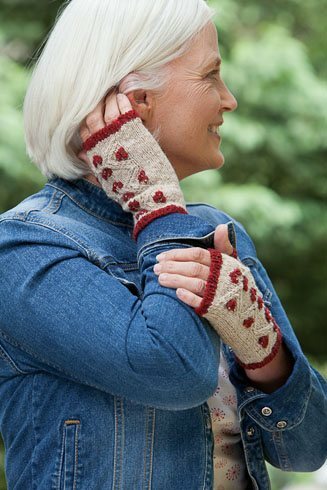 Originally published in Interweave Knits Holiday Gifts 2012, Cranberry Mitts can now be purchased as a single pattern from the Interweave Store. 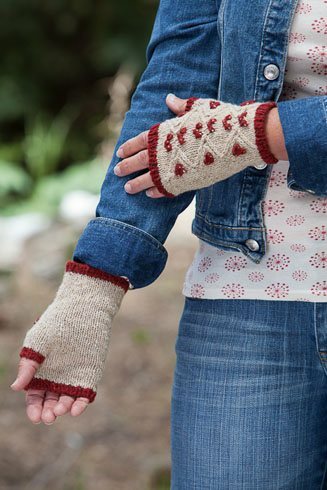 Cranberry Mitts are fingerless gloves worked in the round from the bottom up with a knitted in thumb gusset. Bobbles worked in a contrast color look like clusters of berries against a background of twisted stitches. 7" hand circumference and 6½" long. Rowan Fine Tweed (100% wool; 98 yd [90 m]/25 g) #360 Arncliffe (MC) and #369 Bainbridge (CC), 1 ball each. US 1/2.25 mm and US 2/2.75 mm: set of double-pointed (dpn). Markers; stitch holder; tapestry needle. 24 sts and 36 rnds = 4" in St st on larger needles; 19 sts of Cranberry chart = 2¾" wide.